Living With Chrones Disease: Do Additives Cause Chrones Disease Problems ? Do Additives Cause Chrones Disease Problems ? In Australia, some research has found that infant milk formula containing added fruit sugars could be the cause to some stomach disorders like Chrones disease, irritable bowel syndrome and ulcerative colitis in children. 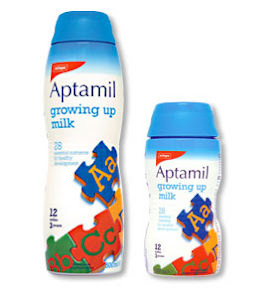 Apparently, some of the new children's milk formula, including big brands like Nutricia and Aptamil contain prebiotics which are supposed to improve the digestion such as fructose could actually be doing more harm that good. This is especially the case for children who may already be susceptible to diseases like Chrones disease. A Gastroenterology expert, Prof Peter Gibson is concerned about the trend towards adding prebiotics to children's formula. He says that "Excessive intake of sugars that escape digestion and absorption in the small intestine contribute to susceptibility and symptom generation in Chrones disease, irritable bowel syndrome and ulcerative colitis." In the Western diet, The excessive intake of these sugars is common, This could possibly be one of the reasons why Chrones disease is so uncommon in places like Africa? People with Chrones disease or IBS who remove these foods from their diet seem to get allot better. Prof Peter Gibson's team measured the prebiotic contents of food in the Australian diet in order to generate a nutritional database. The study found more than half of the 52 patients with Chrons disease who removed prebiotics from their food improved their symptoms. So it seems that prebiotics which provide good bacteria to maintain good digestive health but are likely to make Chrones disease and IBS symptoms worse.